One of the more obscure 8-bit British micros, the Jupiter Ace was released in 1982 for £89.95, and was built around the Z80 processor and the FORTH language. It never sold in large quantities, and despite retaining quite a few followers to this very day, the Jupiter Ace is rare. 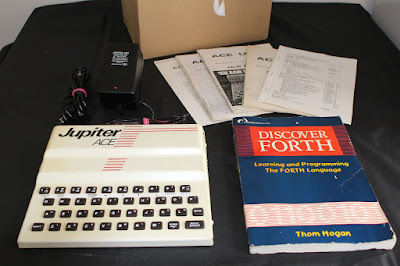 You can still bid on one via this Jupiter Ace eBay auction though. The computer on offer is fully working, and seems to be in great cosmetic condition too. It is accompanied by the power supply unit, the RF lead, and a book on FORTH.